The United Nations is being very clear about the situation for the mostly Muslim Rohingya in Myanmar, calling it catastrophic. Neighboring Bangladesh is awash in hundreds of thousands of refugees and tens of thousands more civilians are trapped in areas of Myanmar's Rakhine state. The United Nations estimates some 429,000 Rohingya refugees have fled violence in Myanmar for Bangladesh since August 25. As the number edges toward half-a-million, U.N. agencies are increasing life-saving assistance to desperate people living in squalid settlements. The number of daily arrivals has fallen to about 1,000 from a high of 20,000 a day. 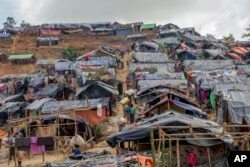 Nevertheless, that steep decline in refugee numbers has done little to ease overcrowding in the makeshift Rohingya sites near two official camps in southeastern Bangladesh. Authorities have allocated an 800-hectare area to new arrivals. The U.N. refugee agency says it is speeding up the distribution of plastic sheeting so as many people as possible can have some protection from monsoon rain and wind. Newly set up tents cover a hillock at a refugee camp for Rohingya Muslims, who crossed over from Myanmar into Bangladesh, in Taiy Khali, Bangladesh, Friday, Sept. 22, 2017. UNHCR spokesman Andre Mahecic says health is a major concern given the inclement weather, overpopulated camps and lack of essential relief. World Health Organization spokeswoman Fadela Chaib says the Rohingya are at risk of waterborne diseases, such as malaria, dengue fever, cholera and diarrhea. Rohingya Muslims cross a flooded area to find an alternate shelter after their camp was inundated with rainwater near Balukhali refugee camp, Bangladesh, Sept. 19, 2017. Chaib says a team of epidemiologists is being deployed to assess the health risks. She says two million water purification tablets and 20,000 cholera kits are being distributed. She says a vaccination campaign against measles and polio launched nearly one week ago is being extended so all 150,000 targeted children are reached.